Children at a disability centre in Hargesia, capital of Somaliland. Children with disabilities have the same rights as all children but are some of the most invisible and marginalized people in the world according to a United Nations report released today, which cites recommendations on how to actively include children with disabilities in civic, social and cultural affairs so that both they and their communities benefit. Produced by the United Nations Children's Fund (UNICEF), The State of the World's Children 2013, launched earlier today in Da Nang, Vietnam, is the first global study dedicated to children with disabilities. The report's underlying message is that girls and boys with disabilities “are not problems” but sisters, brothers, daughters, sons and friends with favourite foods and songs, dreams and rights. Eschewing a focus on traditional notions of “rescuing” the child, the report instead spotlights investment in removing the barriers that impede the realization of the child's rights. Among its key recommendations, UNICEF urges countries that have not yet done so to ratify and implement the UN Convention on the Rights of Persons with Disabilities (CRBD) and the Convention on the Rights of the Child (CRD). There are currently 127 countries and the European Union that have ratified the CRBD – these States Parties are required to promote full equality and participation of persons with disabilities in society – and 76 which have signed the CRD. Discrimination is the root of many of the challenges children with disabilities face, according to the report, whose authors urge fighting that scourge and enhancing awareness of disability among the general public, decision makers, and those who provide essential services for children and adolescents in such fields as health, education and protection. In specific, the authors recommend facilitating access and encouraging the participation of children with disabilities alongside their peers. For example, they site the use of universal designs that can be found in the form of sidewalk ramps, audio books, Velcro fastenings, cabinets with pull-out shelves, automatic doors and low-floor buses. The cost of integrating accessibility into new buildings and infrastructure can amount to less than one percent of the capital development cost, adaptations to an already completed structure can reach as much as 20 per cent of the original cost, UNICEF reports. Another recommendation is to the end the institutionalization of children with disabilities, starting with a moratorium on new admissions and greater promotion of and increased support for family-based care and community-based rehabilitation. “Separating children with disabilities from their families is a violation of their rights to be cared for by their parents unless this is deemed by a competed authorities to be in the individual child's best interest,” according to the report. “Making public services, schools and health systems accessible and responsive to the needs of children with disabilities and their families will reduce the pressure to send children away in the first place,” the authors also noted. Families caring for children with disabilities often bear higher costs of living and lost opportunities to earn income and thus may increase the risk of becoming or remaining poor. Estimates of these additional costs range from nine per cent in Vietnam to up to 69 per cent in the United Kingdom. The authors suggest various social policies that can offset some of the costs, including social grants, subsidies for transportation or funding for personal assistants or respite care. Another alternative is a cash benefit, which is often easier to administer, more flexible at meeting particular needs and allows the parents and children to make the decision of how to best spend the money. Existing supports and services should be continually re-evaluated and varied to include services from a full range of cross-cutting sectors, the authors argue, with the child and family being included in the process. “Children and young people with disabilities are among the most authoritative sources of information on what they need and whether their needs are being met,” the report notes, adding that participation is especially important for marginalized groups, such as children with disabilities living in institutions that are more likely to be abused or exploited than those living at home. As international agencies and donors include children with disabilities in their programmes, reliable and comparable date is needed to guide the planning and resource allocation, the authors claim. The report provides data on children with global and country breakdowns and how they rank on progress towards the universally approved anti-poverty targets known as the Millennium Development Goals (MDGs). While global estimates are speculative, one widely used figure from 2004 is that some 93 million – or one in 20 children aged 14 or younger – live with moderate or severe disability of some kind, according to the report which questions its precision. “The ultimate proof of all global and national efforts will be local, the test being whether every child with a disability enjoys her or his rights – including access to services, support and opportunities – on a par with other children, even in the most remote settings and the most deprived circumstances,” the authors write. 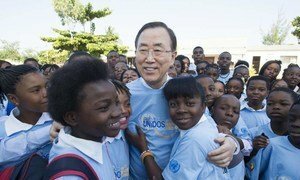 Secretary-General Ban Ki-moon today commended the Government and people of Mozambique for steady progress in political development, but urged greater efforts to overcome human rights challenges, including discrimination and violence against women, through education and awareness-raising.